Give employees peace of mind they are safe while minimizing disruptions to your operation. SafeCide provides fast, accurate, real-time measurements of chemical vapor – giving you the ability to prevent or address concerns in real-time. ChemDAQ designs with you in mind, and even take care of the maintenance and calibration for you. Accurate and reliable detection below exposure limits Unique Sensor Calibration/Exchange Program (SXP®) virtually eliminating systems maintenance. 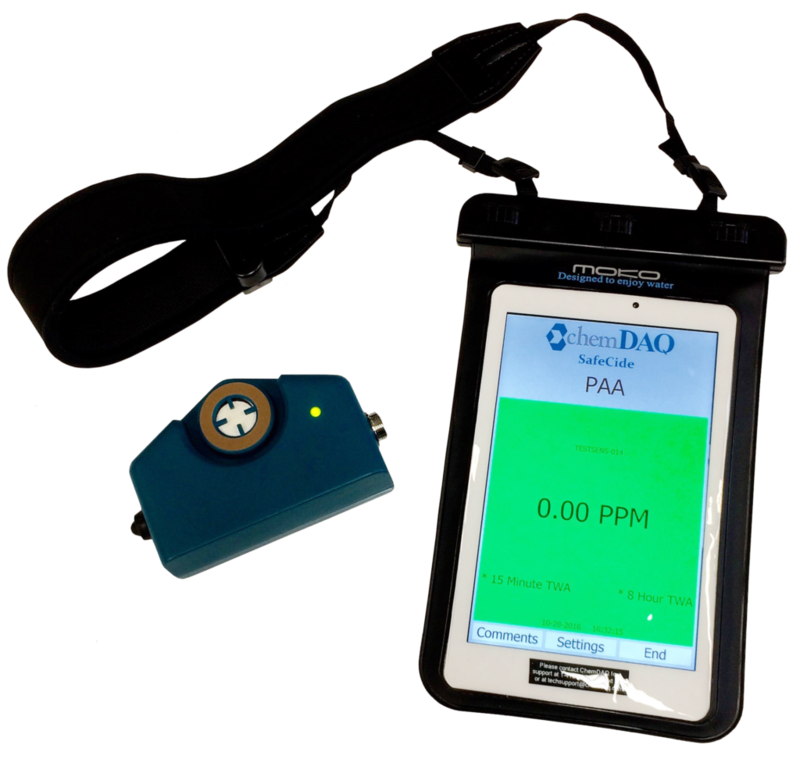 Portable Monitoring for potentially hazardous chemicals including Peracetic Acid, Ethylene Oxide, Hydrogen Peroxide, Oxygen and Ozone. Gas Monitors are installed in areas close to the source but also near the workers’ breathing zone for improved safety and accurate, timely detection. Steri-Trac® peripherals ensure that gas monitoring and display points meet the needs of your unique facility and staff. Chemical biocides are effective and essential tools for preventing the spread of disease in hospitals as well as for food safety and longevity of shelf life, however, they can also have health risks for the people who use them in their work. Failure of fans or exhaust equipment, machine wear and tear, or accidental leaks and spills are all unpredictable conditions which can cause vapour levels to reach potentially dangerous levels. Steri-Trac Gas Monitoring helps you maintain that safe working environment and reassure workers and safety professionals that the breathing environment remains safe. Since sterilant gases are selected to destroy a wide range of biological life forms, any gas which is suitable for sterilization will present a hazard to personnel exposed to it. The NIOSH immediately dangerous to life and health values (IDLH) for the three sterilant gases above are 800 ppm, 75 ppm and 5 ppm for ethylene oxide, hydrogen peroxide and ozone respectively. For comparison, the IDLH of cyanide gas (hydrogen cyanide) is 50 ppm. Thus exposure to even low levels of sterilant gas should not be treated casually and most facilities go to great lengths to adequately protect their employees. In addition, the sterilizer manufacturers go to great lengths to make their products as safe as possible, but sterilizers (as with any mechanical device) can and sometimes do fail and leaks have been reported. Continuous gas monitors are used as part of an overall safety program to provide a prompt alert to nearby workers in the event that there is a leak of the sterilant gas. Sterile Processing, aka SPD or CSSD, is the heart of the hospital, ensuring that vital instruments are cleaned and sterilized sagely and available for use when needed. With such an important emphasis on productivity and quality control, safety is always top of mind. The sterilant chemicals used in your work are a vital component of productivity and patient safety which need to be managed accordingly. Properly maintained and operated, low temperature sterilizers and endoscope re-processors ensure that patients are not exposed to contaminated instruments that can cause infection. However, machines and systems can fail. Monitoring allows for early detection of leaks. This is important for the safety of both your patients and your employees. Continuous monitoring as part of your Quality Control (QC) program provides another layer of safety and validation. Just like equipment must be revalidated after an aborted cycle, monitoring the air allows for process and quality control. Leaks can also pose a safety risk to employees. Technicians that work around high concentrations of chemical sterilants day in and day out are at increased risk of exposure. There are also many misconceptions about sterilant gases/vapors. For example, many people hold the unfounded belief that the hydrogen peroxide used for healthcare sterilization is the same as the hydrogen peroxide you can buy in at the grocery store. That is not the case. In fact, hydrogen peroxide is used in more concentrated doses for these purposes, and there are a number of health risks users should be aware of. With advances in sterilization technology, technicians are now processing equipment multiple times per day, with more concentrated sterilants than previously used. This increases the potential for exposure and increases wear and tear on machines, making monitoring vapor levels an essential safety practice. Ethylene Oxide, Hydrogen Peroxide, and Peracetic Acid all have Occupational Exposure Limits. The best way to ensure you stay within those limits is with continuous monitoring. AAPPA, the Aseptic and Antimicrobial Processing and Packaging Association was formed in early 2015 to address communication, training, and safety education needs and to serve as the voice for the industry. AAPPA brings together food and beverage producers, processors, packaging suppliers, equipment manufacturers, and other stakeholders in the industry. Since its formation, AAPPA has been working to quickly initiate strategies focused on enhancing worker safety education and training needs. AAPPA will also engage in state, federal, and international regulatory developments impacting the food and beverage industry, advocate for sound scientific research on which to base safety standards and thresholds, and lead efforts in the development of best practices for worker protection, spill clean-up, and other safety areas. Biocidal chemicals like peracetic acid are very effective at killing bacterial contamination from meat, poultry and work surfaces. But, for those people who work in processing plants, where large amounts of peracetic acid is used every day there is a significant risk of over-exposure. Maintaining production is essential to remaining competitive; line disruption is costly. 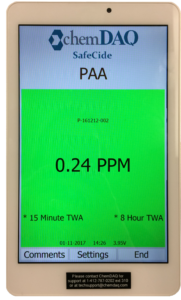 Monitoring for peracetic acid vapor levels in the air allows you prevent or address concerns in real-time, minimizing distractions and enabling you to identify which concerns need to be addressed immediately and which can be part of regular maintenance practices. Steri-Trac and SafeCide™ provide proactive monitoring solutions for maintaining safety when using PAA. Be sure to take measures to control airborne concentrations before the production line is at risk. If workers do become sick or injured, the safety of the peracetic acid itself or the chemical delivery and processing equipment can come into question. ChemDAQ provides you with the tools you need to take the guess work out of managing a major safety hazard for your workers and your business. ChemDAQ supports your safety and productivity goals by enabling you to demonstrate that your work area is safe, while minimizing distractions and maximizing productivity. A real-time monitor and the established exposure limits are 2 important elements required to demonstrate the work area is safe when it comes to potentially hazardous vapors from peracetic acid, hydrogen peroxide, and ethylene oxide. By monitoring vapor levels in the air you can identify which concerns need to be addressed immediately, and which do not, effectively helping you to maximize productivity. You’ll also know immediately when a problem is solved, bringing quick closure and resumption of business. Monitoring exposure levels takes the guess work out of managing the chemicals that are such an essential part of your process to deliver a safe product to the public, while maintaining continuity and consistency in your process. Peracetic acid and hydrogen peroxide used in aseptic packaging are an essential part of delivering a safe food product to the public. Use of these hazardous chemicals in large quantities and high concentration means that it is essential to manage any issues that may arise related to these chemicals. Steri-Trac® Continuous Monitoring and SafeCide™ Portable Monitoring are cost effective, accurate tools to help you accomplish your production goals and maintain a safe environment for employees.